The internet heavyweight invests another $2.6 million into a company tied to the wife of Google co-founder Sergey Brin. 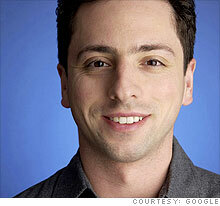 Google co-founder Sergey Brin is married to Anne Wojcicki. 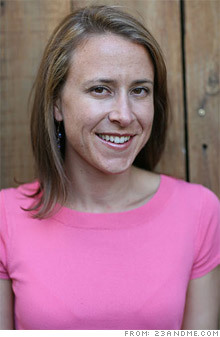 Anne Wojcicki co-founded 23andMe in 2006. NEW YORK (CNNMoney.com) -- When it comes to raising capital in the current economic environment, being married to a Google co-founder has its advantages. Regulatory forms filed Thursday showed the internet search giant recently invested another $2.6 million in biotech firm 23andMe, which was co-founded in 2006 by Anne Wojcicki. Wojcicki is married to Google co-founder Sergey Brin. Google already has a $3.9 million stake in the company, which sells DNA analysis. It made that investment in 2007, shortly after Brin and Wojcicki were married. "We believed the technology had promise the first time we invested and continue to believe that now," said Jane Penner, a Google spokeswoman. "23andMe helps people make sense of their genetic information," Penner said, adding that the company's mission is "consistent with Google's goal of organizing the world's information." Brin, 35, converted $10 million worth of 23andMe debt into preferred stock as part of the transaction, according to the SEC filing. Google (GOOG, Fortune 500) also entered into a lease agreement with 23andMe. But Penner declined to comment on the details of the lease agreement and referred questions to 23andMe. A spokeswoman for 23andMe could not be reached for comment. The name 23andMe refers to the 23 pairs of chromosomes that make up each individual's genome. Both Google and 23andMe are based in Mountain View, Calif.